According to Statista, Latin America and the Caribbean is the fourth region with the highest number of internet users, behind Asia, Europe and Africa with an estimated 55% of the Latin American population accessing the internet in 2017. The forecast for 2019 is that user penetration in Latin America jumps to 60.9%. TeleGeography states that at the end of 2016, Latin America was home to 72.4 million fixed high-speed broadband internet customers. One year later, at the end of 2017, that access grew to 77.4 million. 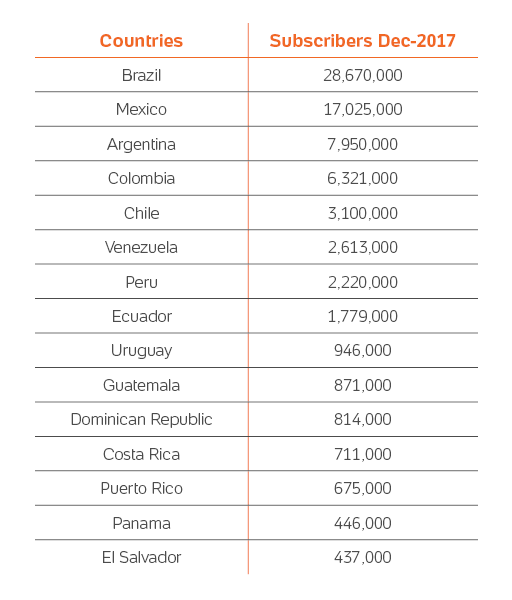 Taking a more regional outlook, the table below shows the top 15 markets for fixed broadband in Latin America. It is interesting to note that the top five markets account for more than four-fifths of all the region’s users. Comparing 2016 with 2015 in the Americas region, this Fastmetrics table shows us which countries experienced the largest increases to average internet speed. While it can also be noted that the average internet connection speeds in Latin America are slower than the speed in the United States and Canada, that doesn’t prevent local digital consumers from doing their online shopping or other important online activities such as internet banking. Unless a lot of downloading is being done, it is unlikely that a difference can be noted in the top 8 Latin American countries with the fastest internet. The “fastest” LATAM country in the table is Uruguay (6.2Mbps) whereas Brazil (5.5Mbps) was the country to have the largest increase of average internet speed in Q3 of 2016 (+51%). Akamai, a content delivery technology vendor, lends us an additional perspective of the average connection speeds in the Americas in a publication called “State of the Internet”. When considering mean download speeds over fixed broadband in Latin America, Chile leads the pack by having the fastest internet speeds in Latin America's major markets, with average connection speeds of 8.6Mbps in Q4 of 2016 and Uruguay comes in at second place. Apart from Paraguay, all of the other countries studied in the Americas saw year-on-year growth in speed. 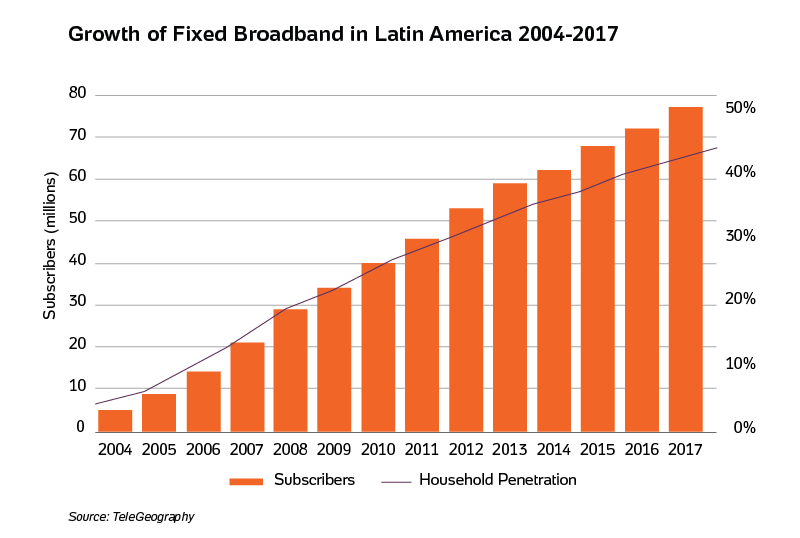 Continuing to look at the data presented to us, the fixed broadband market in Latin America had a compound annual growth rate of 12.9% between the end of 2004 and end-2017. Looking further into the future, we continue to see a steady growth of fixed-line broadband penetration rate in selected countries in Latin America with source projections describing that 21% of the population in Chile will access the internet over a fixed-line broadband connection in 2022, up from 17% in 2017. The development and progress of the internet continues in Latin America and online consumer spending has begun its recovery following the recent economic slowdown. This creates opportunities for e-commerce merchants to invest in this emerging region and be a part of this steady subscriber take-up, while also appealing to a region with savvy digital consumers. Of course, there are still challenges related to the quality and equality of internet access such as differences that persist between rural and urban areas. However, other challenges such as payment collection and cash being the dominant way of paying are taken care of by BoaCompra.